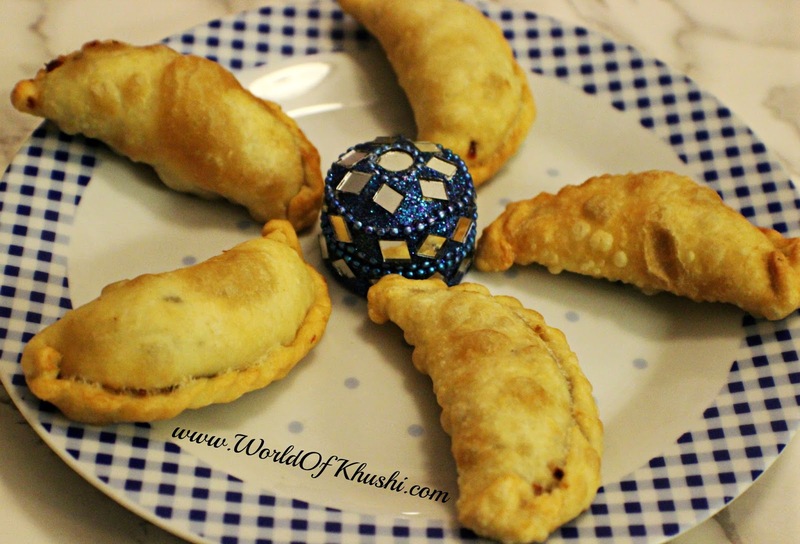 In today's post we are sharing Karanji also known as Karida Kadubu Recipe. 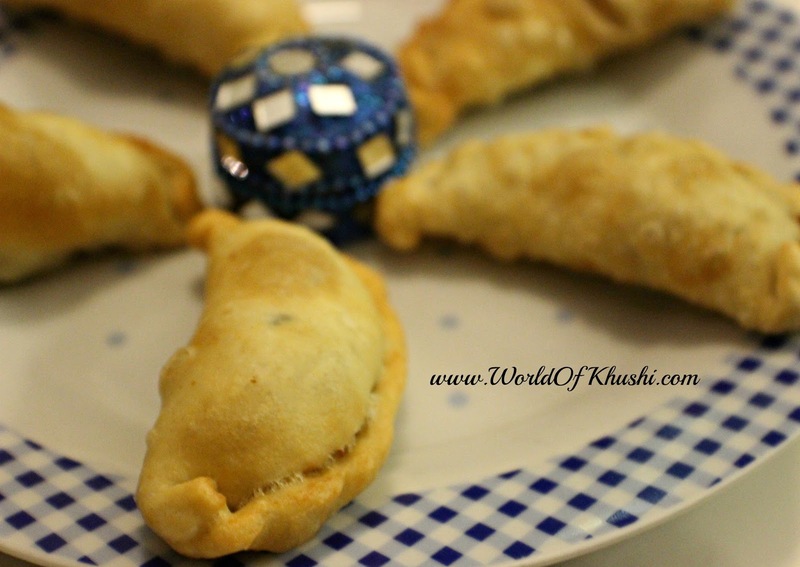 It is a sweet dumpling filled with Jaggery and Coconut. There are so many different varieties of stuffings for this recipe and it is also called by so many different names in various states of India. In my side we call it Gujiya which is either filled by Rava or Mawa and most commonly prepared during Holi and Diwali Festivals. In Maharashtra this dish is called as Karanji and in South it is popularly known as Karida Kadubu and it is a very popular recipe during Ganesh Chaturthi. The Kadubu filling can be of Gram Dal too but here we are making the simple version. I tried this recipe first time and it turned out well. I hope you guys will like it too. Lets see how to make it!! Step 1. Heat Ghee in a pan and roast chopped dry fruits. Step 2. Now add Jaggery and Coconut and roast it till Jaggery melts. Cook for 5-6 mins. Step 3. Slow down the flame and add Cardamom Powder. Cook for 2 more minutes. Step 4. Your filling is ready. Let it cool down to the room temperature. Step 1. In deep bowl, take Maida, Rava and add pinch of Salt. Step 2. Add hot Ghee to the mixture and carefully mix the mixture with spoon as Ghee is very hot. Step 3. Slowly add lukewarm Milk & start to knead the dough with the help of your hands. Step 4. Cover it with damp cloth and leave it aside for 10-15 mins. Step 1. In a Pan start heating the Oil. We need medium hot oil, don't heat it too much otherwise the Karanji will not be cooked properly. Step 2. Make a Glue for sealing the edges. It can be made by mixing 1 tbsp of Maida with 3 tbsp of Water. Step 3. Roll out one portion of the dough & make small balls. Step 4. Flatten each ball in your palm. Roll out into a small diameter puri. Step 5. Filled the puri with your stuffing. Apply the Glue on the border of the puri and then fold it in half. Step 6. Give it a Karanji Shape (Press on the edge and fold it inside and tip that comes out press it again and fold it. Repeat the same process until you get the complete Karanji Shape). Step 7. Deep fry the Karanji in low flame till you get Golden Brown Color. Let it cool down and then you can store it in Air-tight Container. Your Delicious Karanji /Karida Kadubu are ready!! Note :- You can also use Fresh grated Coconut instead of Desiccated Coconut. Your beautiful and tasty Karida Kadubu/ Karanji is ready to be eaten. You can store it in air tight container in cool place. Enjoy this Ganesh Chaturthi with your loved ones. 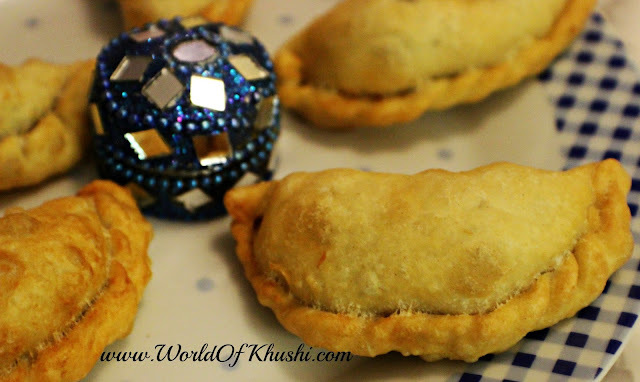 If you want to see more festival recipes from Khushi's World check out here.